Dante Alighieri (1265–1321). The Divine Comedy. The best part of the Divine Comedy for a few minutes' reading is the "Inferno." There the reader finds the most vivid descriptions, the most startling and unforgettable pictures. ARGUMENT.—The sacrilegious Fucci vents his fury in blasphemy, is seized by serpents, and flying is pursued by Cacus in the form of a Centaur, who is described with a swarm of serpents on his haunch, and a dragon on his shoulders breathing forth fire. Our Poet then meets with the spirits of three of his countrymen, two of whom undergo a marvelous transformation in his presence. Pointed in mockery and cried” “Take them, God! So close, it took from them the power to move. They swarm’d, to where the human face begins. Of Aventine spread oft a lake of blood. The hideous monster intertwined his own. That which was either now was seen no more. As the dark pepper-grain livid and swart. As if by sleep or feverous fit assail’d. He eyed the serpent, and the serpent him. Breathed a thick smoke, whose vapory columns join’d. Nor thine, Nasidius. Ovid now be mute. Softening, his indurated to a rind. So lengthen’d, as the others dwindling shrunk. One upright rose, and prone the other fell. Were shifted, though each feature changed beneath. Into due size protuberant the lips. Into the head, as doth the slug his horns. Closing unites. That done, the smoke was laid. Confusion hung, and on my thoughts amaze. The other’s fate, Gaville! still dost rue. Note 2. Capaneus. Canto xiv. Note 3. Near the Tuscan shore. Note 4. Said to have been of the family of Donati at Florence. Note 5. “Agnello.” Agnello Brunelleschi. ARGUMENT.—Remounting by the steps, down which they have descended to the seventh gulf, they go forward to the arch that stretches over the eighth, and from thence behold numberless flames wherein are punished the evil counsellors, each flame containing a sinner, save one, in which were Diomede and Ulysses, the latter of whom relates the manner of his death. Thou beatest, and thy name spreads over hell. And no proud honour to thyself redounds. Were in good time, if it befell thee now. Would so it were, since it must needs befall! For as time wears me, I shall grieve the more. We downward traced, and drew me up the steep. Sped not our feet without the help of hands. I envy not myself the precious boon. That none exhibits token of the theft. Deidamia yet in death complains. To pause till here the horned flame arrive. “O ye, who dwell two spirits in one fire! The boundaries not to be o’erstepp’d by man. On the other hand already Ceuta past. Made our oars wings, still gaining on the left. Note 1. “Shalt feel what Prato.” The Poet prognosticates the calamities which were soon to befall his native city, and which, he says, even her nearest neighbor, Prato, would wish her. The calamities more particularly pointed at are said to be the fall of a wooden bridge over the Arno, in May, 1304, where a large multitude were assembled to witness a representation of hell and the infernal torments, in consequence of which accident many lives were lost; and a conflagration, that in the following month destroyed more than 1,700 houses. See G. Villani, Hist. lib. viii. c. lxx. and lxxi. Note 2. The flame is said to have divided the bodies of Eteocles and Polynices, as if conscious of the enmity that actuated them while living. Note 3. The wooden horse that caused Æneas to quit Troy and seek his fortune in Italy, where his descendants founded Rome. Note 4. Perhaps implying arrogance. Note 5. The Strait of Gibraltar. Note 6. 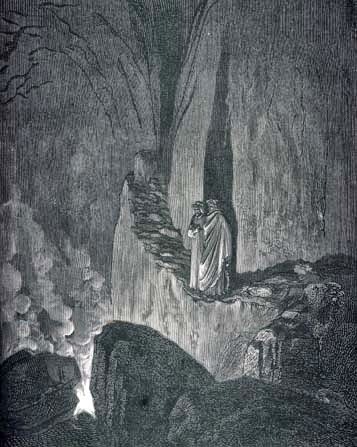 The mountain of Purgatory.—Among various opinions respecting the situation of the terrestrial paradise, Peitro Lombardo relates, that “it was separated by a long space, either of sea or land, from the regions inhabited by men, and placed in the ocean, reaching as far as to the luner circle, so that the waters of the deluge did not reach it.”—Sent. lib. ii. dist. 17. Note 7. “Closed.” Venturi refers to Pliny and Solinus for the opinion that Ulysses was the founder of Lisbon, from whence he thinks it was easy for the fancy of a poet to send him on yet further enterprises. The story (which it is not unlikely that our author borrowed from some legend of the Middle Ages) may have taken its rise partly from the obscure oracle returned by the ghost of Tiresias to Ulysses (eleventh book of the Odyssey), and partly from the fate which there was reason to suppose had befallen some adventurous explorers of the Atlantic Ocean. ARGUMENT.—The Poet, treating of the same punishment as in the last Canto, relates that he turned toward a flame in which was the Count Guido da Montefeltro, whose inquiries respecting the state of Romagna he answers; and Guido is thereby induced to declare who he is, and why condemned to that torment. Forth issuing, drew our eyes that way to look. And piled in bloody heap the host of France. Where they are wont, an augre of their fangs. Or ever summer yields to winter’s frost. Lives so ’twixt tyrant power and liberty. Nor fear lest infamy record the words. The high priest, 11 again seduced me into sin. And how, and wherefore, listen while I tell. The nature of the lion than the fox. Wretch that I was; and well it had bestead me. Which used to mark with leanness whom it girded. That Penestrino cumber earth no more. For the deceitful counsel which he gave. E’er since I watch’d him, hovering at his hair. Of those who load them with committed sin. Note 1. The engine of torture invented by Perillus, for the tyrant Phalaris. Note 3. Polenta’s eagle.” Guido Novello da Polenta, who bore an eagle for his coat-of-arms. The name of Polenta was derived from a castle so called in the neighborhood of Brittonoro. Cervia is a small maritime city, about fifteen miles to the south of Ravenna. Guido was the son of Ostasio da Polenta, and made himself master of Ravenna in 1265. In 1322 he was deprived of his sovereignty, and died at Bologna in 1323. This last and most munificent patron of Dante is enumerated among the poets of his time. Note 4. The territory of Forli, the inhabitants of which, in 1282, were enabled, by the stratagem of Guido da Montefeltro, the governor, to defeat the French army by which it had been besieged. See G. Villani, lib. vii. c. lxxxi. The Poet informs Guido, its former ruler, that it is now in the possession of Sinibaldo Ordolaffi, whom he designates by his coat-of-arms, a lion vert. Note 5. Malatesta and Malatestino his son, lords of Rimini, called from their ferocity, the mastiffs of Verrucchio, which was the name of their castle. Malatestino was, perhaps, the husband of Francesca, daughter of Guido da Polenta. See notes to Canto v. 113. Note 6. Montagna de’ Parcitati, a noble and leader of the Ghibelline party at Rimini, murdered by Malatestino. Note 7. Lamone is the river at Faenza, and Santerno at Imola. Note 8. Machinardo Pagano, whose arms were a lion azure on a field argent. See also Purgatory, Canto xiv. 122. Note 9. Cesena, situated at the foot of a mountain, and washed by the river Savio, that often descends with a swollen and rapid stream from the Apennines. Note 10. Guido da Montefeltro. Note 12. Boniface, VIII, whose enmity to the family of Colonna prompted him to destroy their houses near the Lateran. Wishing to obtain possession of their other seat, Penestrino, he consulted with Guido da Montefeltro, offering him absolution for his past sins, as well as for that which he was then tempting him to commit. Guido’s advice was that kind words and fair promises would put his enemies into his power; and they accordingly soon afterward fell into the snare laid for them, 1298. Note 13. Alluding to the renegade Christians, by whom the Saracens, in April, 1291, were assisted to recover St. John d’Acre, the last possession of the Christians in the Holy Land. Note 14. Celestine V. See notes to Canto iii.